A new UK tour has been announced for the rock and roll musical Buddy: The Buddy Holly Story, which will open in Harlow in August 2016. The production originally opened in the West End in 1989 and enjoyed a successful 25th anniversary worldwide tour in 2013. 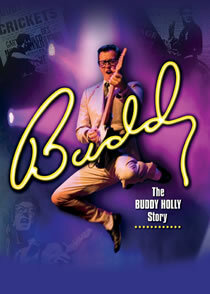 Buddy tells the tale of the musical icon's meteoric rise to fame and his final legendary performance at the Surf Ballroom in Clear Lake, Iowa, before his tragic and untimely death at the age of 22. The show features many of Buddy Holly's greatest hits, including "That'll Be The Day", "Peggy Sue", "Oh Boy" and "Rave On". Other songs include "Chantilly Lace" and "La Bamba". Buddy: The Buddy Holly Story opens at Harlow Playhouse on 31st August ahead of a 14 week tour visiting Skegness, Chesterfield, Guildford, Watford, Portsmouth, High Wycombe, Hayes, Croydon, Swansea, Dartford, Bournemouth, Northampton, Crewe and Swindon. Dates and booking links here.